Toenail Clipper for Thick Toenails /Toe Nail Nipper by KlipPro - Germany Quality, Best for Thicken Toenails due to Fungus/Diabetes/Senior/Pregnancy or Ingrown Toenails. 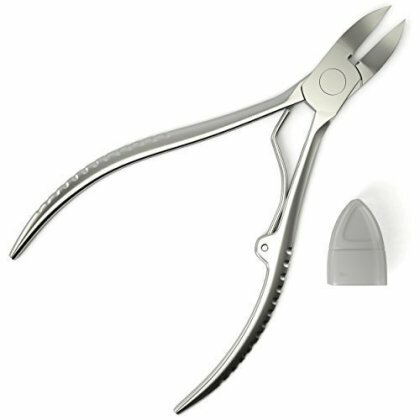 Jaw opens wider than 2.5cm , Handle 13cm long, Brushed Stainless Steel , Podiatrist .. Seller Comments - Please leave us a review after you've tried our product. Photos or videos will be greatly appreciated as it would be helpful to other shoppers. If you encounter any issues with the product please contact us at support@klippro.com before you leave the review. IDEAL FOR THICK NAILS, Ingrown nails or Deformed nails due to Fungus/Diabetes/Aging/Pregnancy. Blades open over 1" wide. Top of blades are slightly curved to contour around nails. Easy to cut and maneuver to provide clean and smooth cuts. For cuticle trimming, we recommend KlipPro KP-740 which is ideal for removing dead skin build-ups or hang nails. MADE FROM PREMIUM BRUSHED STAINLESS STEEL. You never have trouble cleaning up your nail clippers since the KlipPro Toenail Clipper/Nipper is made from premium quality brushed stainless steel.Simply wipe the clippers with alcohol after use, let it dry and store for next use! We have another model which has soft rubber grip KP-900N if you prefer rubber handle. SECURE STORAGE. The KlipPro Toenail Clipper/Nipper includes plastic tip covers for the blades to keep the clippers hygienic and clean while in storage.